A. 's spelling test last week included the word tack, a nice "short a" sound word. Used in a sentence: "Tack now! You're about to hit my boat." M.'s contribution: "Tack is the opposite of jibe." Only in a sailing family. Haha, this post made me giggle, love the photo that went along with it! Hope we'll be tacking today if it stops raining!!! 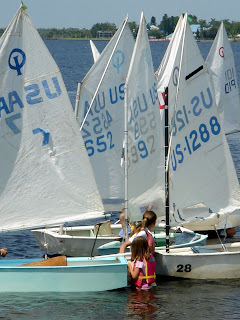 The weekend is flying by and no sailing so far. Great sentence by the way!